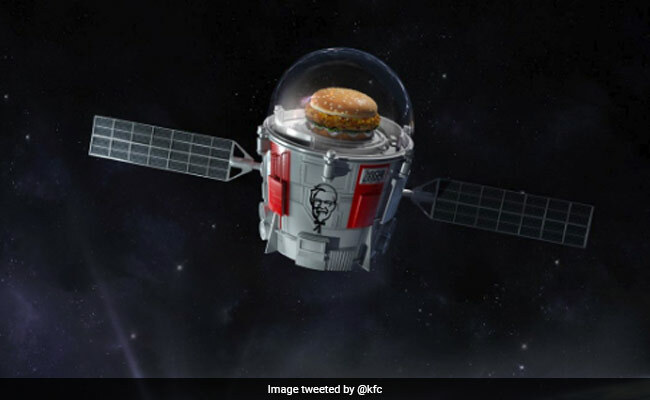 In a promotional stunt that's truly out of this world, fast-food chain KFC plans to send a chicken sandwich into "space" with the help of a high-altitude balloon. Well, technically, the burger will travel to the edge of space and, of course, Twitter has a lot of questions about the whole exercise. KFC is partnering with World View, a company that makes stratollites, or high-altitude balloons, on the project. According to KFC, its Zinger chicken sandwich is scheduled to take flight on or after June 21. The launch will be broadcast live online. According to a promotional website, the "Zinger 1 Space Mission" will take the chicken sandwich to "new heights. Specifically, heights around 80,000 feet straight up into space." KFC says the Zinger will travel to the stratosphere where it will stay between 60,000 and 80,000 feet above the Earth's surface for four whole days. "The stratosphere is considered 'near space,' where all the good chicken sandwich missions are set." World View co-founder Taber MacCallum explains while the "chicken sandwich payload is a bit funny," the "one-of-a-kind marketing experiment" allows the company to reach out to a more mainstream audience. "The Stratollite was created to deliver more routine and meaningful access to space for all, and this mission allows us to give edge-of-space access to a commercial customer that would previously deem a project like this unimaginable." That sandwich is out of this ! Well this seems like a waste of money and resources....no cure for cancer but let's build a rocket and send a sandwich into outer space! For the greater good of future space and fried chicken enthusiasts. Kinda feels like you should know the answer to this one, Al. You gonna start delivering burgers to the ISS as well?